Hi, I'm Jess. 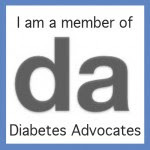 Me and D (Type 1 Diabetes) have been together since I was 10. I've been using a Medtronic pump since 1998 (love my pump!) and began my tumultuous yet rewarding affair with their CGM in December 2010. Switched to Dexcom Seven Plus in June 2012. These are my random thoughts and musings. Enjoy!